There has been lots of buzz that Young Adult could be a "dark horse" Oscar contender, and I was interested to see it, especially at an early screening. I generally like director Jason Reitman's movies a lot (Juno, Up in the Air, Thank You for Smoking, etc. ), and he worked with writer Diablo Cody on Juno, which is one of my favorite movies. 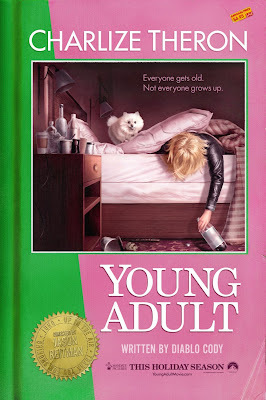 Unfortunately, Young Adult ended up not really being "my cup of tea," though perhaps others will like it better. Mavis Gary (Charlize Theron, Hancock) is a ghostwriter of a young adults series, Waverly Prep, which has just been canceled. She needs to write the last book in the series, however, and she has no inspiration for it. Sick of the random guys with whom she's been having one-night stands, she convinces herself that her high school sweetheart, Buddy Slade (Patrick Wilson, TV's A Gifted Man), is the one she is meant to be with, even though he is married with a newborn daughter, and so Mavis returns to her hometown of Mercury, Minnesota, for an extended stay at the Hampton Inn. Mavis tells everyone that she's in town for a real estate deal, even though she's there trying to snag Buddy, and some people are excited that she has returned, as she is a "famous book writer" now. There were a lot of things I liked about Young Adult but also a lot that I did not. It's more of a "slice of life," dark humor type of movie, which is not always my favorite. Theron is great in the role of Mavis, who is depressed and definitely screwed up, and there's also Patrick Wilson, Elizabeth Reaser (The Twilight Saga: Breaking Dawn Part 1) as his wife, and Patton Oswalt (A Very Harold & Kumar 3D Christmas) as another classmate of Mavis's, who listens to Mavis's deranged plan to get back with Buddy. The humor was very "real life," if that makes sense; in one scene, Mavis asks her mom why she still has her wedding day portrait on the wall (Mavis is now divorced), and her mom says that she likes to remember that day: "It wasn't all a failure - the tiramisu was pretty good." Buddy is oblivious to Mavis throwing herself at him and when everything comes crashing to a head at the end of the film, it plays out very ugly, which I think is what Reitman and Cody intended it to be. Maybe see this film. I thought it was okay, but others may like it more, especially other critics, as the reviews so far have been mostly positive. In one scene, Mavis asks one of her girlfriends how anyone could still live in Mercury, since it's such a small town (Mavis now lives in Minneapolis, or the "Mini Apple," as the Mercurians call it), but at the same time she is stuck in the past as well, pining for an old boyfriend that she almost certainly cannot have. It's later revealed in the film why she hates his newborn child and his wife (Reaser) so much, which will certainly cause the audience to feel pity for Mavis. However, I feel that the film could have benefited by using flashbacks of them in high school, or otherwise show exactly why Mavis is so obsessed with Buddy, though it could be because he was her last "serious" relationship. Young Adult is in theaters today, December 16th, and is rated R with a runtime of approx. 100 minutes. 2.5 stars out of 5. *Author's note: I saw a screening on this film on November 15. The version I saw may or may not be its final version.